I was fortunate enough to get two Sufjan Steven albums for Christmas. 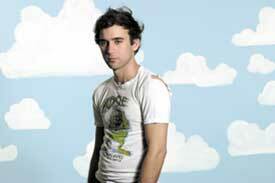 Sufjan Stevens is a Christian, and a dab hand at creating cool chilled out alternative music. His music is generally not worship music, although his lyrics do often have a Christian theme running through them, for instance two of the free songs you can get are from his his Christmas Album. I first came across him over a year ago when Amazon gave away some free mp3s to promote various bands. This shows the power of giving away free things, I’m sure I’d never have known of him or listened to his music if it hadn’t been for that promotion. And now someone has purchased two cds on my behalf because of it (I requested the present!). This inspired me to search around and see what free songs you might be able to get for Sufjan Stevens now. Sufjan is on the asthmatic kitten records label, and this is a good thing as they are a generous bunch. They provide five free mp3s of Sufjan Stevens, as well as interesting summary of his life and various other things. I particularly love Sister Winter and Holland, although they are all worth listening to. Hopefully you’ll become a fan just like I have! Here are some other websites about Sufjan Stevens that are worth checking out.. In 2006 Tom Eaton animated the video for Sufjan Stevens’ Put The Lights On The Tree and asthmatic kitten records host this on YouTube, if you go to the YouTube site there are other related Sufjan Steven songs too. This is a great website and full of loads of information about Sufjan, including upcoming gigs etc. Pocketknife did a remix of “Put the Lights on the Tree” which he generously provides free.